Having enjoying the past couple of weeks of beautiful sunshine and calmer seas another bout of stormy weather has hit the Canary Islands. 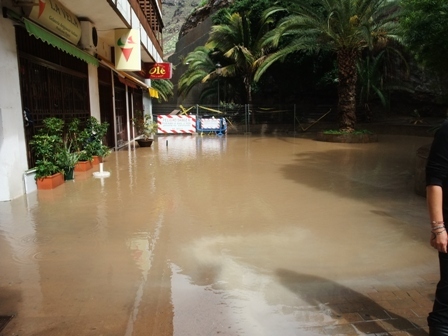 The gusty conditions follow the heavy rain that fell for several hours early on Tuesday which caused severe flooding to Gran Canaria and Fuerteventura. The Emergency Services in Lanzarote had one of their busiest days in recent times with 240 call-outs. 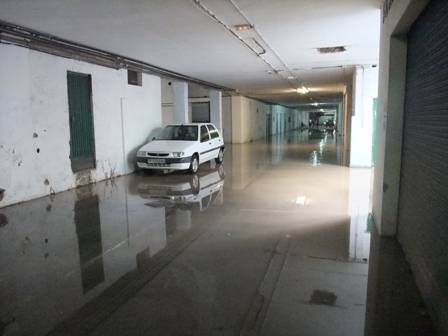 Trials at the island’s main courthouse had to be called off when the building was flooded and Arrecife port was closed for several hours due to the sea conditions. 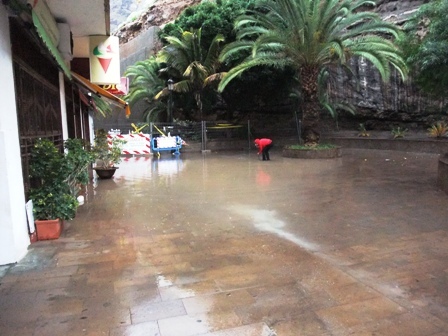 Meanwhile parts of La Gomera were also badly hit, with roads blocked by mudslides and debris. 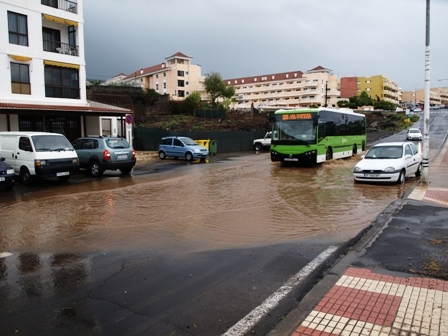 The bad weather forced the authorities in Tenerife to close the roads up to Mt Teide due to the snow and ice, although they were later reopened. The sea conditions off Los Gigantes are rough but we got off lightly with only a few showers and not too much wind. The Met Office has warned of another storm front gathering in the Atlantic off the Canaries which is expected to enter from the west at the week-end. 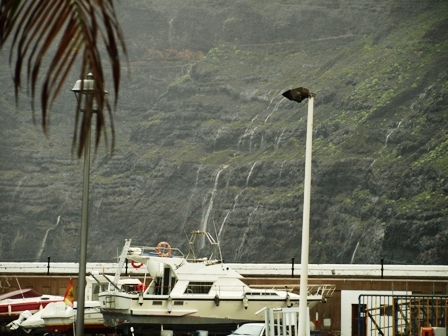 Los Gigantes continues to be battered by high winds and torrential rain. The orange alert issued by the Met Office is extended until Tuesday evening. 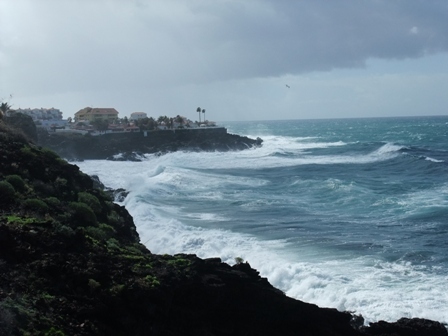 A yellow alert for the south of Tenerife, La Gomera and El Hierro has been issued with warnings of heavy seas and gale force winds which could reach up to force 6 or 7. Floods and electricity cuts are causing major chaos and the fire brigade and local authorities are working round the clock to unblock drains and clear the blocked roads of rocks. 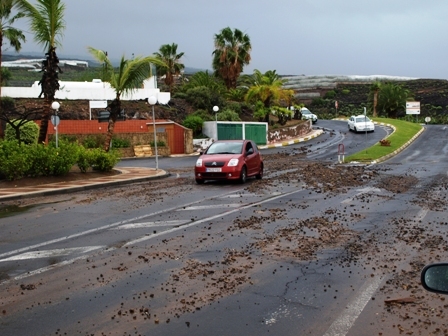 The Cabildo de Tenerife Road Services Department has closed the TF-631 road from kilometre 3 to 4.8 from Abades to San Miguel de Tajao in Arico, due rock falls caused by torrential rain falls. 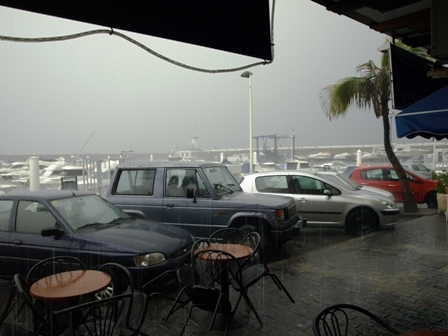 The TF-21 Teide road from La Orotava is also closed because of hail storms. Access to the National Park using any of the other roads is not recommended. 1. Stay calm and stay at home; be on the alert for possible danger areas such as gullies and drains etc. nearby. 2. Keep watching local media for the latest weather updates. 3. Avoid driving during heavy rain. If you have to drive, pay particular attention to the depth of the water and be careful when braking. If your vehicle starts to fill with water, park it safely and abandon it. 4. If you are driving, keep to the major roads avoiding secondary roads, and drive in a lower gear. 5. Don’t cross bridges if the water has risen above the road level. 6. Don’t go into the lower areas of your house if they are flooded, such as garages and basements etc. If you are flooded, leave your house and find higher ground. 7. Disconnect the electrical power in these circumstances. Don’t use lifts in case there is a power cut. 8. If flooding has trapped you in the upper levels of your house, don’t attempt to leave it by swimming as you could be swept away by the current. It is preferable to call 112 and wait for help. 9. Keep a battery powered radio and follow instructions issued by the Protección Civíl through the press, television and radio. 10. Avoid unnecessary phone calls in order to keep lines open for emergencies. 11. In case of emergency, call 112. These guidelines will be updated as weather conditions change.